Did you know that November is Adopt a Senior Pet Month? If not, now you do! So often, seniors are passed over in shelters for younger cats or kittens, which makes seniors harder to adopt out, oftentimes with them staying longer in the shelter than younger pets. But with a senior pet, you know what you’re getting! They’re full-grown in size, they’ve already developed into their personality, and a senior pet just knows that you’re rescuing them. To celebrate and encourage adopting senior pets this month (and any month), I’d like to share with you the adoption story of Mary Moon. 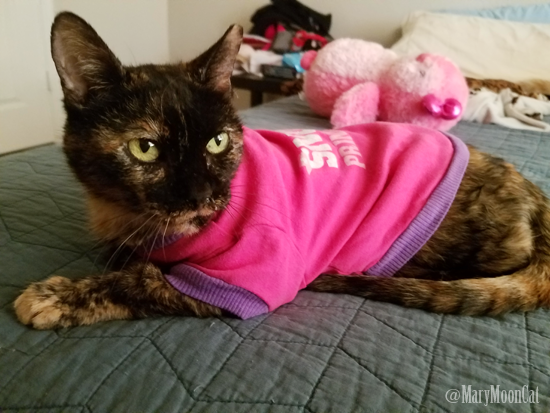 This senior tortie cat’s Instagram profile (yes, of course Mary has an Instagram account!) says: “Professional lap cat and sweater connoisseur.” That sounds pretty intriguing. I simply had to know more about this adorable senior cat. Mary Moon is estimated to be at least 10 years old, but her exact age is unknown, having started her life on the streets. Mary’s adoption tail begins over five years ago when she was rescued from the Gilbert Riparian Preserve by the rescue group Save the Cats Arizona. When she first came to the rescue, Mary wasn’t very friendly and didn’t like being touched. 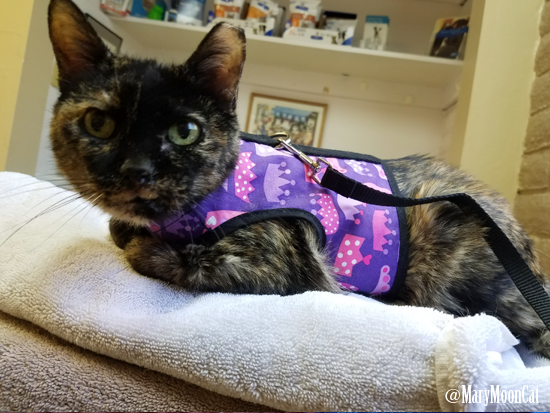 During her time with the group, the senior tortie struggled with upper respiratory issues and needed a lot of TLC. 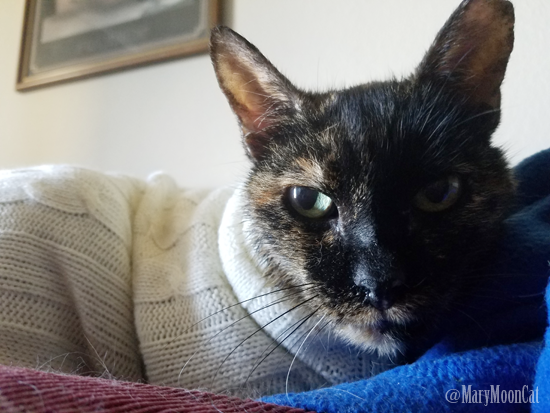 Although unfortunate to have health issues, it was that extra TLC that helped Mary warm up to people. And what do you know…she became a volunteer favorite! As Mary Moon warmed up to the volunteers caring for her, she would jump into an empty lap and offer a purr. Still dealing with a few issues, though, Mary drooled a lot and had trouble grooming herself. She required frequent wiping down and also had trouble handling cold weather at the sanctuary. So, when the weather would grow chilly, volunteers dressed Mary Moon in sweaters – and she loved them! Ashley J. started volunteering at the sanctuary at Save the Cats Arizona in May of this year. During the new volunteer orientation, Ashley noticed a small tortie cat curled up in a cube watching the group of new volunteers. When Ashley inquired about the tortie, she learned of Mary’s story and she quickly became one of Ashley’s favorite cats at the sanctuary. After a while, though, Mary left the sanctuary and went into foster care for several months, while having dental work done (13 extractions!) and subsequently recovering from it. In August of this year, the rescue asked if Ashley would consider fostering Mary. 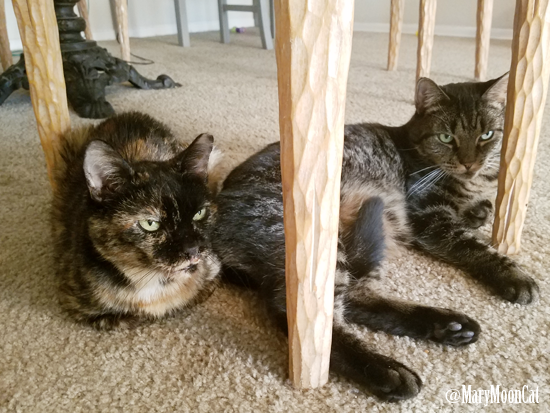 She jumped at the chance, having missed Mary at the sanctuary, and took her home to start fostering the senior tortie cat. When Mary arrived at Ashley’s home, she looked so much healthier after her dental surgery and was drooling much less. And the best part, Mary fit right in at her new foster house. Ashley’s own resident cats accepted her quickly, and it seemed as if Mary had always been there. 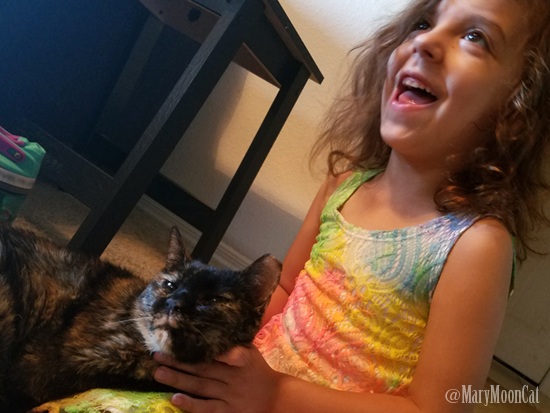 The whole family, including Ashley’s five-year-old daughter, instantly fell in love with the tortie. Mary was home. Ashley and her family officially adopted Mary on September 19, 2016, about five weeks after taking her home to foster. Mary joined four other cats at Ashley’s house, three of which are also senior cats. Mary with new sister Audrey. Audrey, who is now 10 years old, was bottle-fed as a kitten by Ashley. Why do you love cats so much? I’ve never lived a day without a cat. Growing up, I was very ill as a child. I had my cat, Bug, by my side the whole time, though, and she always greeted me whenever I got back from the doctor or hospital. I remember feeling like her purring by my side worked better than the icky medicine my parents made me take. Why did you choose to adopt a senior cat? 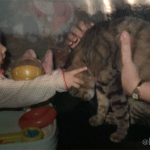 My childhood cat, Bug, lived to the age of 22. I witnessed a lot of what would be considered her senior years. She showed me that “senior” doesn’t mean boring. Mary and my other three senior cats play with toys just as much as my young cat. Two of my cats, I raised from kittens and I have not forgotten the challenges that come with kittens. Of course I – like everyone – love kittens, but they really can take a lot of work. With a household already full of cats, a five-year-old, and both my husband and I working full-time, it just wouldn’t be a wise choice for us to get a kitten at this point in our lives. Mary Moon and her human sister. What would you like readers to know about adopting senior cats? Give them a chance! It’s much easier to find a senior cat who will be the right fit for your lifestyle than trying to mold a kitten. Want a lap cat? There’s a senior one at your nearest shelter or rescue, I’m sure. Want a playful kitty? Don’t rule out the seniors. There are fewer surprises with senior cats when it comes to behavior and personality. What is your favorite thing about Mary Moon? Just the fact that she came from being in the wild, having never known a home, to being the sweetest lap cat I’ve met in my life. Her capacity to love and trust humans after everything she has been through is just amazing. I love that I can always count on her to jump up and cuddle with me when I’m binge-watching Netflix. And the sweaters. How can you not love the sweaters? I probably have more sweaters in my closet for Mary than for myself! Would you ever consider adopting a senior cat? If you’re on Instagram, be sure to follow Mary Moon and her sweater-wearing adventures! What a lovely story! I’m so happy that Mary Moon is doing so well now and found a forever home. I have 2 cats that I adopted as kittens, but they are now 11 and 14 years old. There is just something special about senior pets. Senior cats are a wonderful world. Thanks Rachel! What a heartwarming story!!! Up until Truffles and Mudpie all of my rescue cats were seniors. They are so special. I just followed Mary Moon in IG and can’t wait to see more of that precious little lady! Thank you for introducing her to us. Aww – thank you for the wonderful story. All of my kitties were rescue cats, with my mom’s current cats being a stray I rescued and her kitten. She is now a senior kitty and the love of her life! What a great post! Mary Moon is adorable, and it’s so fantastic that she’s found her furever home. I wonder if I can talk my mother into knitting a sweater for our Angel; she too loves to play dress up! 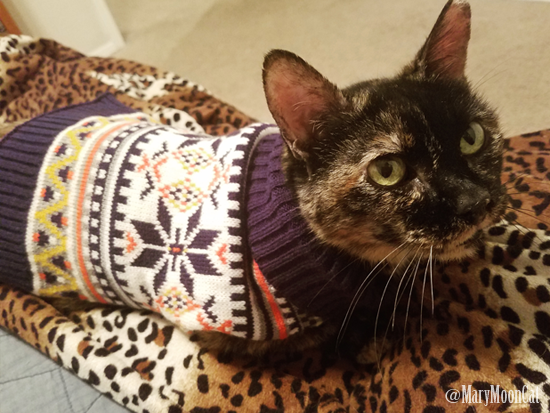 Mary is stylin’ in her sweaters! I have to object to calling her a senior at 10. I’m 11, possibly 12, and I don’t feel or act like a senior. With the peeps limited income, the only way they could adopt a senior would be through a program like PAWS has. If money was no option, they’d love to adopt one. I love happy endings! Thanks for sharing this story. What a great story. And she likes sweaters – too cool. I’d love something else to shop for. My dog likes sweaters too – but we live in Canada not Arizona so there’s an obvious reason. He gets cold easily in winter. Those are seriously some ADORABLE kitties! Thanks for sharing awareness about adopting AND adopting seniors! I love Mary Moon and her story (and her sweaters)! I am such a huge believer in senior adoption and am thrilled to see the joys and advantages of it highlighted! Thanks to posts like this, more and more people are realizing how special it is! That is so sweet Mary Moon wears sweaters. I tried with my cat, but it just wasn’t happening. She’s a cutie. I love Mary Moon’s story and am so glad she has a loving home. She is adorable and looks so cuddly! The first cat I adopted, Waddles, was 9 1/2 when I adopted her. I knew very little about cats then, so I didn’t even know she was a senior. She lived to be 21. We had such a strong bond, and she taught me so much about cats and about love. I say give senior cats a chance! What a beautiful story. It is sad how often seniors are overlooked in shelters. so it’s always heartwarming for me to hear when older pets get a chance at a happy life. Such a wonderful story and a wonderful family! Such a beautiful story, I’m so happy Mary Moon found her forever home. I love those sweater fashions too! Mary is so very purretty. What a pawsum story. Mommy woulda luvved to adopt an older kitty, she just doesn’t know how long she will actually live and can’t afford da extra Vet bills dat usually accompany older animals . But we luv ’em. Dat’s pawrt of mommys purroblem, she ;uvs ’em all. :) Big hugs to all. What a lovely story! I am glad Mary Moon has her forever home. She is a pretty girl and looks very sweet in her sweaters. several of my adopted strays have been considered “senior” (7 or older) when they came to me and my bestest cat ever, who came to me as a 1.25 malnourished kitten, lived to 19.5. Even with having to adapt to special needs and more expensive vet care (I give my cats better healthcare than I give myself), I love senior cats!! Missing question: Are the sweaters bought or hand made? Total magic – what a girl she is and YES Seniors are the best pets ever!!!!!! What a wonderful story! We too adopted a senior pet from the shelter. Poor guy was in a kennel with like 6 other dogs and totally overlooked. Now he has been with us almost 2 years and we couldn’t imagine life without him! Oh my gosh, the cuteness of Mary Moon is literally OVER THE MOON! Her sweaters are adorable. I wonder if Rosie would wear a sweater …probably not. I’m so glad she found a home. I love adopting seniors and wish more people would consider it. If I didn’t have HORRIBLE allergies – we totally would. Montecristo’s best bud is a HUGE Russian Blue. He’d love a nice, sweet older cat to snuggle with. I lived in AZ for 10 years and volunteered at the Maricopa county shelter but I’ve never heard of Save The Cats Arizona! What a wonderful organization. I love Mary Moon’s story, how sweet that she can now live out her senior years in a loving family of other senior kitties. Great story, perfect for this month! Such a truly lovely and heartwarming story! I’m just so thrilled that Mary Moon is doing fabulously and has a forever home! How wonderful Mary Moon found someone who was willing to take her in and give her a forever home. That is a wonderful story. Mary is such a cutie and so cute in her sweaters. You had me at rescue cats and sweaters! The fact that rescuers won her over when putting Mary Moon in sweaters is the best story EVER. I love that Ashley brought her home and adopted her. Great and happy piece! Wahooo and meow wow for happy endings. I appreciate these feel good moments with all the sadness in the world. I also am digging these sweaters. The kitty is all happy and blinged out. I am so happy for Mary and her new family! If I ever get another cat, I am 90% sure that it will be an older cat. 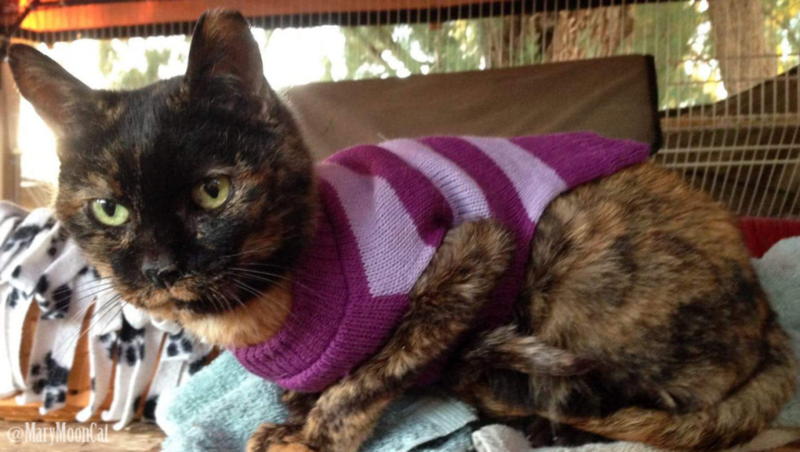 She looks adorable in the sweaters and it sounds like her new home is a great fit! Mary Moon is a perfect “spokeswoman” for adopting seniors. We get older of course – who doesn’t – but we never lose our desire to BELONG or our desire to share our capacity to LOVE. I think Mary was very fortunate to move from foster to permanent forever and I would hope that more people would look BEYOND age, and into our eyes to see that we are SO ready to belong to someone………..
Hugs, Sammy the Old Guy! What a wonderful story! I love her many sweaters! 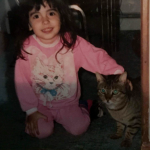 I have always grown up with cats. My Mom loved them them – and all ages! I currently have an adopted feral kitty. Our late kitty angel brought him home one day and he was a wild boy! But my daughter worked with him and he is now part of our family. He does think he’s a dog though…! What is amazing is their capacity for love, even with all the unknowns in their past. oh my goodness! 13 teeth extracted? Maybe a silly question, but how does she eat? Good question! Domestic cats can eat just fine without teeth, even dry food. And usually with the teeth removed, they will likely feel much better and eat better than before. What an inspirational heartwarming story. Adopting a senior like Mary Moon can be so rewarding. Love the sweaters- she certainly has more than me just in the photos LOL. Very cute. Mary Moon is such a beautiful kitty and what a lovely story! We are so happy that she finally found her furever home, we love a happy ending :) and she looks so adorable in her cute sweaters. I love Mary and her fab sweaters! I wish more people knew how awesome senior cats are. There are so many awesome seniors out there looking for homes. Thanks for sharing Mary’s story! We hope all senior cats get their forever homes.